Adjusts the speeds of the player, NPCs, horses and many creatures to give a more realistic feel, while maintaining a good game flow. This mod seeks to adjust the ludicrous vanilla movement speeds to a more realistic level. Most noticible, it reduces the general movement speed by about 20%, but also changes the combat dynamic by adjusting strafing speed and the speeds of some creatures. The result is a much more realistic feel to the general movement, while maintaining a good game flow and in my opinion actually improving it. I recommend using NMM for installation or even easier head to the Steam Workshop and subscribe. 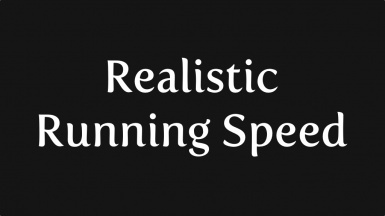 If you prefer manual installation put "Realistic Running Speed.esp" in "./steam/steamapps/common/skyrim/data" and activate it in the launcher under "Data Files"
Note: This mod does not change values for the speedmultiplier but for the base speed. So make sure you haven't set player.setav speedmult to anything but the default 100 or you won't get the intended effect of this mod. You are free to use this mod for a compilation as long as you give credit. This mod comes "as is" and unfortunately hasn't been tested with Dawnguard, since I'm not really playing Skyrim at the moment. This update is a service to the people who still use and love the mod.